Server Upgrades Will Make Your CrossPostIt Experience Better! We have great news for you, CrossPostIt’ers. Your multi-channel listing tool is about to get a boost that will make your CPI experience so much better. Over the next few weeks, the server infrastructure that makes up the backend of your software will be getting a slew of upgrades that will speed up page loads and increase overall stability of the CrossPostIt platform. As part of the recent acquisition of CrossPostIt, Data Age is dedicated to providing the best multi-channel listing software in the industry. While this means that many new features will be coming to the platform, it’s also important that the systems that drive CrossPostIt be optimized, efficient, and up to date. This way the software can run smoothly and reliably, and future updates can be seamlessly released on a stable platform. This is only the first step, but it’s an important one because it lays the foundation for the future. It’s important that before any new features and integrations are built out, the server infrastructure and environment is up to date and running at peak optimization and efficiency. While these upgrades will not change the look, feel or flow of the software, they will provide a major increase in speed and efficiency. Faster page loads will mean that we can build pages that pack in more features to make your workflows as efficient as possible. More efficient memory usage will allow us to build out more backend automation to do your work for you. And up-to-date systems will provide a more stable and secure platform, decreased downtime, and so much more. 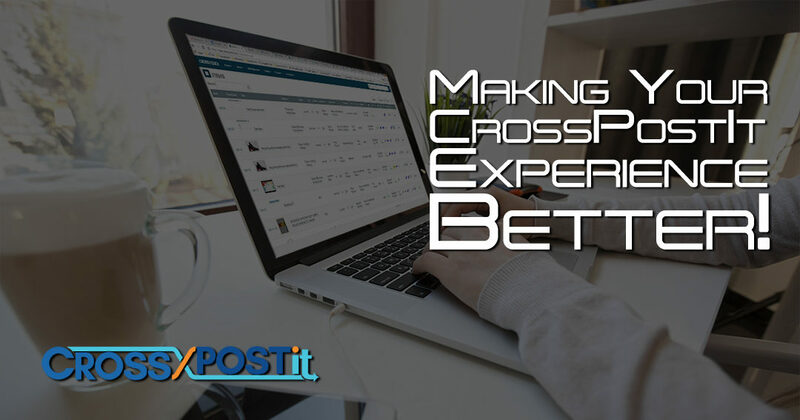 We’re excited to release these improvements and we will continue to provide you, the loyal customers that make up the CrossPostIt family, the best multi-channel listing software in the industry.